Treasure of the Trinity. Together with his friends Andrea and Olivia, Kevin is situated at mister Logandog’s home, who actually died few weeks ago. Kevin believes that in Mr. Logandog’s house lies a hidden treasure. We are talking here about six coins that date from the time of Incas. Among this civilization, this treasure is known as the treasure of the trinity. Kevin wants more than anything to find these six coins and his last mission is to take them into the museum because he is scared that someone else might find them and actually sell them. That would mean a real disaster. Every heritage that is stolen and taken away from one people or country means you have big problem. That is why museums are the most adequate places that a treasure should be kept, those are the places that were actually made for that, among other purposes. We are sure you will love to help Kevin, the guy who is looking for the justice and fights with everyone who tries to harm other people or property. It takes few minutes to actually make this guy happy person again, and bring the justice on board. 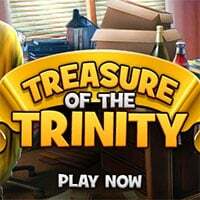 Treasure of the Trinity is a free online hidden object game on Hidden4Fun.